The social worker sacked after Victoria Climbie's murder has lost her appeal against her dismissal. Lisa Arthurworrey, 35, now banned from working with children, claimed she was made a scapegoat by Haringey Council. But an employment tribunal found the north London body had acted reasonably in sacking her. Victoria, eight, died in 2000, malnourished and with 128 scars on her body. Her great aunt and partner are serving life sentences for her murder. Miss Arthurworrey, a former junior social worker, was dismissed for gross misconduct in November 2002 after she made a series of errors in the child's care, the central London tribunal heard. Clearly upset, she fled the hearing an hour into the judgement when it was clear she had lost the case. She had insisted she was "hung out to dry" for Haringey's mistakes, chaotic organisation, flawed procedures and poor supervision. But the tribunal found she had been negligent and lacking in professionalism. Refusing the claim, chairman Thomas Ryan said the tribunal had sympathy for her as she had to live with the consequences of the case. But he added: "The decision to dismiss her was one that a reasonable employer might have made. The claimant was reasonably dismissed." 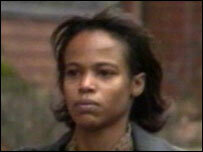 Miss Arthurworrey had 18 months post-qualification experience when she was assigned Victoria's case in August 1999. Within six months, the child was dead with more than 100 injuries. She had suffered months of abuse, torture and neglect at the hands of her great aunt Marie Therese Kouao and Kouao's boyfriend Carl Manning. Both are now serving life imprisonment for murder. Haringey claimed Miss Arthurworrey was negligent and failed in her duty to safeguard and promote the interests of a child in her care. Lord Laming's public inquiry into Victoria's death found child protection services had missed at least 12 chances to save her life. An internal report by Haringey Council identified eight key mistakes made by Miss Arthurworrey and recommended disciplinary action against her and five colleagues, the tribunal was told. Haringey's report author Bernard Monaghan noted Lord Laming had pointed out 23 areas where Miss Arthurworrey should have acted differently. During the tribunal, she agreed with 12 of those points, disagreed with eight and agreed in part with three. Of the eight failings, the tribunal found six were proven. Haringey said it held a wide-ranging investigation before suspending and sacking Miss Arthurworrey. She now earns £13,000 a year working for a charity and was seeking compensation. She also blamed Haringey for the depression and breakdown she suffered after Victoria's death, including a five-week hospital stay from June 2003 because she was suicidal.